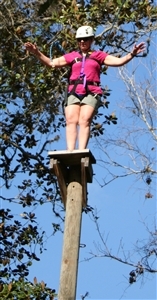 Linda Hartney of Pinecliff Camp, Utah, surveys the world from 20 feet up ... On the count of three, she takes the "Leap of Faith" ... And then basks in the cheers of her team members below. Photos by Susan Green. FRUITLAND PARK – The people who make United Methodist camps across the nation the stuff of spiritual inspiration and renewal flocked this week to Warren Willis Camp and the Life Enrichment Center (LEC) to relax and recharge during the winter lull. 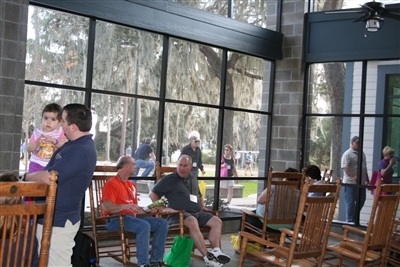 More than 300 out-of-state camp staffers, along with vendors, presenters and Florida Conference employees, turned out for the biannual National United Methodist Camp and Retreat Leaders Gathering. That means nearly 400 people who know how to retreat checking out Florida's largest retreat center. No pressure there, said Mike Standifer, executive director of camps and retreats for the Florida Conference. "It's not so bad," Standifer said Tuesday between cell phone calls about minor emergencies across the shady grounds on the shores of Lake Griffin. "Hopefully the feedback is positive and constructive and helpful. It is an honor to be hosting it." UMC camp staffers from around the U.S. arrive at Warren Willis Camp's Barnett Lodge from the nearby Life Enrichment Center during a national get-together. Photo by Susan Green. This year is the first since the mid-1990s that the national gathering has been held in Florida Conference facilities. It also marked the first test of the newly remodeled and enlarged Barnett Lodge at Warren Willis hosting such a large crowd other than summer campers. Participants came from as far away as Washington, Oregon, Colorado and New York. Vickie Lawson, who coordinated the event for United Methodist Camp and Retreat Ministries, which represents 200 facilities in the U.S., said the planning committee tries to rotate among retreat centers. She said members had to pick a place large enough to accommodate the crowd and "it's always nice to go somewhere warm." 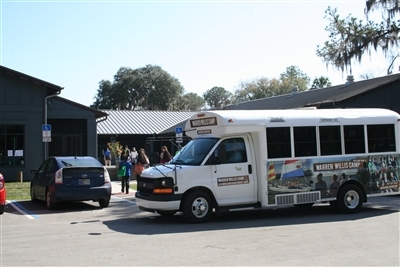 Fruitland Park's proximity to Orlando didn't hurt either, she said, as camp workers who bring their families can extend their stay and visit attractions like Disney World. The week included worship sessions, an exhibit hall and workshops ranging from practical matters like insurance, finances, meal preparation and staff certifications to spiritual considerations like morning calls to worship and introducing people with disabilities to Christ. Joel Pancoast, left, and Will Cooper lead a workshop on how sailing builds faith at the National UM Camp Leaders Gathering at Warren Willis Camp. Photo by Susan Green. Wildlife, part of the unique experience of Warren Willis, contributed to the learning experience by demonstrating some of the challenges faced by camp operators. Program director Joel Pancoast's plan to send participants in the High Ropes workshop down a zip line about five stories high was derailed when a woodpecker whittled a baseball-sized hole in one of the support poles, apparently overnight. The discovery did not leave time for repairs. 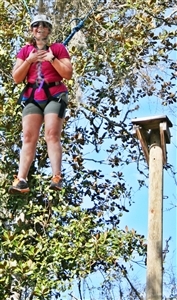 Pancoast emphasized the importance of inspections and safety as he introduced the equipment needed for children and adults in a high ropes program. 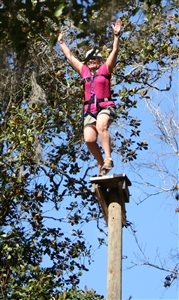 Harnessed workshop participants then took turns taking a "leap of faith" off a small perch atop a 20-foot pole, with the rest of the group cheering below. Although it is important to keep events moving so that everyone gets a chance to participate, it is often the person who freezes and can't jump without coaxing that best teaches lessons of teamwork and looking out for one another, Pancoast said. "Usually the kid that sits up there for 20 minutes and gets the whole group screaming and cheering does more for that group than if every kid goes through four times," he said. Attendees at the National UM Camp Leaders Gathering check out the exhibit hall at Warren Willis Camp's Barnett Lodge. Photo by Susan Green. 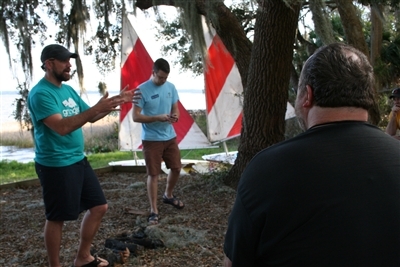 Later, Pancoast and Will Cooper, a LEC staff member who used to work at the Don Lee Center in Pamlico County, North Carolina, discussed the value of camp sailing programs. They said forging relationships is the key to building a spiritual retreat experience. "The danger aspect is a transformative property," Cooper said. People who sail in bad weather and survive through teamwork build relationships that can open the door to conversations about discipleship. "They see the power that is in the storm and that is in working together," Cooper said. "Sailing can draw in the churched and non-churched." Pancoast noted that he learned to sail as a young camper at Warren Willis. "This is the lake I learned to sail on in the seventh grade," he told workshop participants. "We're using it to find avenues to hang out with kids, and through relationships, we find ways to introduce them to Christ." Keeping the spiritual renewal element in the United Methodist camp experience has been one of the biggest challenges in recent years because of the distractions of technology, Lawson said. Participants in the National UM Camp Leaders Gathering socialize and talk shop on the patio at Barnett Lodge while waiting for workshops to start. Photo by Susan Green. On one hand, she explained, technology has enhanced educational, communication and connection opportunities. 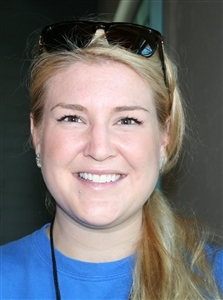 In fact, retreat leaders this week used Twitter and Facebook to keep attendees apprised of schedule changes. On the other hand, with almost everyone from children to seniors bringing their cell phones, iPads and laptop computers to retreat centers, technology can sometimes interfere with the primary goal of a spiritual getaway. "It's the challenge of being able to get people to really disconnect and focus on the moment," Lawson said. "It's not just a matter of connecting with yourself and others [at camp] but with God and the spirit. … That's a challenge we really didn't face that long ago." Attendees interviewed at the gathering said comparing notes and getting advice were among the biggest benefits. Genny Nadler from Don Lee Center said she got advice from a new Tennessee acquaintance about programming and motivating college-age camp counselors. Mike Eaker, a 26-year camp veteran and site manager at Living Springs Camp in central Illinois, said he was interested in discussions of portable camp experiences for team-building and the notion of taking camp to people where they are. Rev. 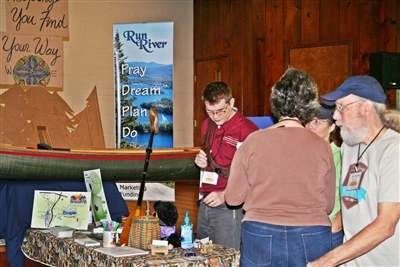 Alice Shirley, camp programs coordinator for the Illinois Great Rivers Conference, said those who came to the meeting from her ministry saw it as a way to "stay fresh and energized." "For us, I think it's good team-building because we don't play together that often," she said. From left, Kim Stuby, Ed Hoke, Rev. 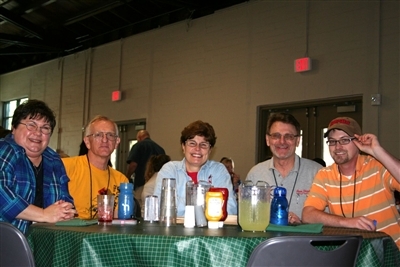 Alice Shirley, Mike Eaker and Curt Franklin from camps in the Illinois Great Rivers Conference enjoy lunch and fellowship at a national meeting for UMC camp staffers. Photo by Susan Green. "We came for renewal in terms of worship and being reminded of why what we do is important. … It's connecting and reconnecting with people on the same journey." Lawson said that is the primary goal of the meeting. "Only the people who do it [camps and retreats ministry] know the beautiful things about it and what makes it hard," she said. "It's an opportunity for us to get together and share stories."